STG 2. Josefina Rivera and CeCe McDonald | Survivor Team Go! 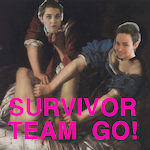 In this, the second episode of Survivor Team Go!, we shout out to Ryan (different Ryan!) and Rihanna. Then Bailey shares the story of Josefina Rivera, who survived being abducted and tortured with several other women in a psychopath’s basement, and Oliver talks about CeCe McDonald, a black trans woman who was prosecuted for surviving a hate crime.